GoDaddy express email marketing is one of the popular names in internet marketing sphere. GoDaddy is it is one of the biggest registries for registration of domain name registration. Apart from domain name registration, they have the 4th. generation hosting service with revolutionary new hosting platform & email marketing service under one roof. Recently GoDaddy expresses email marketing has been changed to GoDaddy email marketing. Hence if you have any existing Email Marketing Account with GoDaddy, the same account shall be upgraded to new account automatically without any charge. At the time of account renewal, you will be charged a price which is lower between the new and old price. Godaddy had three plans like economy, deluxe & premium. In the economy plan, they charge $9.9 which is having a capacity to send email up to 500 subscribers. Their deluxe plan having a limit of 2,500 subscribers & charge of $14.99 /month. Similarly, the premium plan has a limit of 10,000 subscribers & charge up to $19.99. Now in the new pricing plan, they even made the price cheaper for the beginner email marketers. 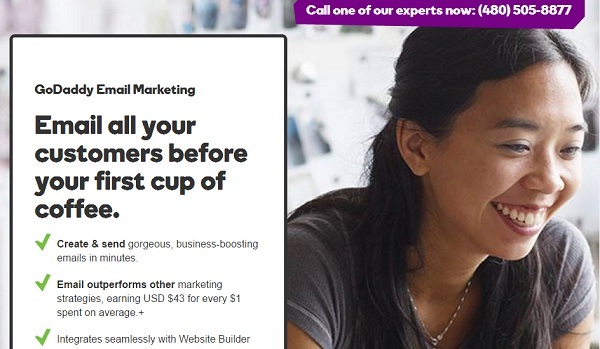 GoDaddy Email Marketing have also the pricing plan namely Beginner, Up & Running & Pro. In “Beginner” plan, they charged at a price of $6.9 instead of the old pricing $9.9 to send email up to 500 subscribers. The “Up & Running” plan cost $7.9 instead of the old price $14.99 /month having a limit of 2,500 subscribers. With the “Pro” plan you can send email up to 5000 subscribers which cost $14.99. In order to make a trial one has to be a customer for at least 1 month by paying the required fee. GoDaddy has a good discount plan for the long-term contract. It offer 10%, 15%, 20% discount for 1, 2 & 3 years respectively. 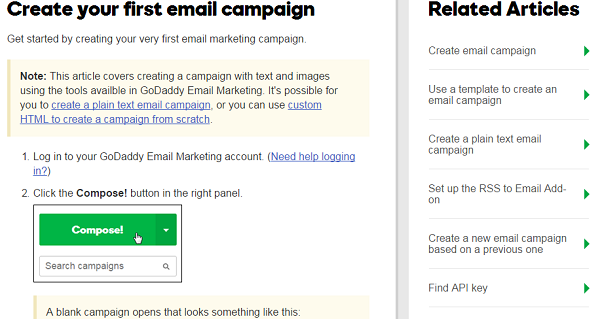 With GoDaddy email marketing templates you can help you create successful campaigns efficiently. Godaddy has 160 customized email marketing templates ready to create any emails or newsletters for any field. It has over 20,000 image directory for use it in newsletters to get an ultimate professional look. Automatically announcing your email offers on the top social networks like Facebook, Twitter, LinkedIn, MySpace etc. It has the ability to create both HTML & text emails & having easy email editor facility. GoDaddy has all the tools like list manager, social media management tool, easy list import & can handle bounce & unsubscribe list. It also offers email tracking report of no. of email sent, opened & clicks on the offer mentioned in emails or newsletters. Get started with new GoDaddy Email Marketing Now! Unlike other email service provider, GoDaddy provides a lot of tutorials in form of web pages and videos to educate their client. It has well-organized product support for different product Go Daddy offers. It offers a help section like articles, blog posts, and forum threads related to its email marketing. The customer can call anytime (24/7), send email, chat & also can create a support ticket by logging in as a customer. Pros: The services & customer support provided by GoDaddy is excellent. 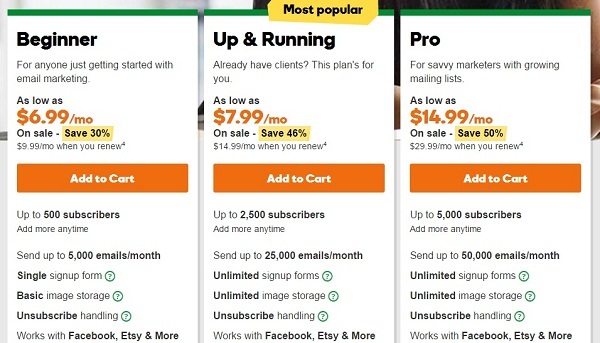 The pricing structure in the new Godaddy’s is cheaper in comparison to other email marketing services of some repute. It offers unlimited image hosting, which is lacking in some other email services. At the time of writing this Godaddy email marketing review, we do not find any adverse about their service. Cons: GoDaddy does not have a trial offer like other email marketing service providers. One has to be a customer to avail service of GoDaddy email marketing.